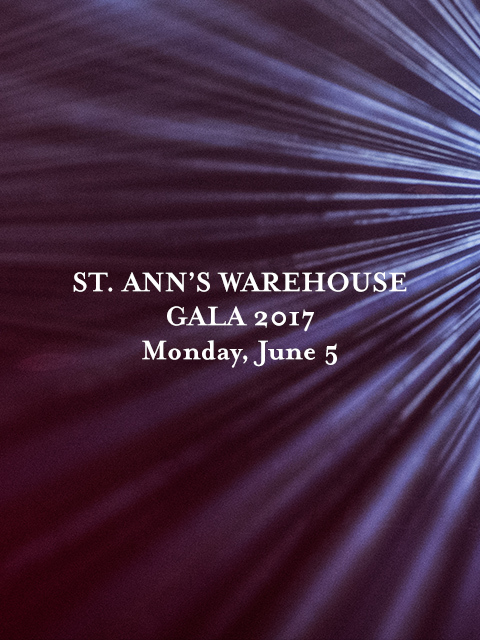 It’s Gala time again at St. Ann’s Warehouse! And we hope you will join us on June 5th, 2017, to celebrate the power of art in turbulent times. We have invited Lena Hall to create a concert for St. Ann’s at the intersection where theater meets rock and roll. Lena’s extraordinary range and rare combination of grit and beauty recall the great voices of past generations. We are also grateful for the privilege of honoring Buzzy O’Keeffe and Steve Hindy this year, two inspirational pioneers who set the bar (literally!) on vision, fortitude and excellence for those of us who followed in their path. What would Brooklyn have been like without the amazing institutions of The River Café, celebrating its 40th year, and Brooklyn Brewery, rounding on 30? Please join us in recognizing Buzzy and Steve. As is the tradition, we’ll begin with cocktails at 6:15pm on the waterfront and in the Max Family Garden, followed by a concert with Lena Hall and a family style dinner in the Joseph S. and Diane H. Steinberg Theater. If you saw Hedwig and the Angry Inch, you will remember Lena’s Tony Award winning performance as Yitzhak. And if you who didn’t, you are in for a special treat, as Lena performs repertoire from Janis Joplin to Led Zeppelin to Radiohead and Talking Heads, among others. Attire for this event is festive. Full evening includes: Cocktails, Concert and Dinner. You will be recognized in the Gala program and on the St. Ann’s Warehouse website. Wine generously donated by Joe and Diane Steinberg. Beer lovingly provided by Brooklyn Brewery. Goods and Services associated with the Gala Benefit for attendees are $300 per ticket. The remainder is a tax-deductible contribution to St. Ann’s Warehouse, a 501(c)3 not-for-profit organization.